I finally got a sewing machine this last Christmas from Andrew. I've been asking for one for ages and he finally gave in. I wanted one for a long time so that I could make clothes and try out other cool things. It's been hiding in the corner of the office since Christmas, but I finally got around to picking what I wanted my first project to be: A bubble dress for Isabelle! Originally, I had been casually looking around online for some cool Disney themed outfits for Isabelle to wear for our Disney trip, but I kept coming across things that I didn't like or things that were way too expensive for my taste. It took awhile before it occurred to me that I could just make one for her. Duh! It sounded ridiculously perfect that I can't believe it took me awhile to figure this out. Well, I went online to search for some free tutorials. Gotta love the internet. 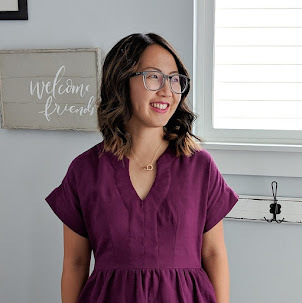 I came across a bunch that I loved, but I stuck to the bubble dress as my first project since it seemed simple enough for me to do. I learned to use a sewing machine back in junior high school and haven't really used one since, except once in high school and another time recently for a doll I made Isabelle for Christmas. It surprisingly comes back fairly quickly. I did have to learn a few things I never learned before, like threading the machine, etc., but it wasn't too bad after I figured that out. Us: "Yeah, Isabelle signs and talks a ton now." Them: "That's cool. What does she sign and/or say?" I have no idea why it's so hard for us to remember, but we always seem to forget all that she knows whenever someone prompts the question so I figured I should keep track of her vocabulary at some point. That way, I can look back to remember how far she's progressed. Even with Jadon, whenever we tried to count the signs he knew we'd get to maybe 20 and then a long while later we'd realize that we completely left out large categories of signs. And another Christmas has come and gone. We didn't have much snow this year for Christmas, but I had a feeling the weather would make it up to us in no time. Of course it did right after Christmas. It snowed a ton and the weather dropped to the negatives. Thank goodness we don't have to shovel our driveway. Thanks to HOA fees, we only have to shovel our sidewalk (which is itty bitty) and the walk to our door. And some days, when we're lucky, the guys who shovel our driveway are nice enough to shovel our sidewalk too! Gotta love it here. It occurred to me several days ago that this was Jadon's 4th Christmas and Isabelle's 2nd Christmas. This year was definitely lots of fun because Jadon knew very well what was going on this year and Isabelle also had a better appreciation for all the wonderful gifts given to her. Both the kids were spoiled like crazy of course from both sides of the family as well as from Andrew and me. They'll definitely have some great stuff to last them awhile. I'm thinking of doing a handmade holiday next year where all the gifts will be handmade, but we'll see how that goes. Andrew loves being able to spoil the kids this time of year. According to him, this is the only time other than their birthdays that it's acceptable to buy them mounds of gifts. Thanks to Andrew, the kids got plenty of toys all around from Santa and from us.